I have a new favorite vocabulary program. So do my kids. All of them, ages 8 to 17. Word Up! The Vocab Show is simply fantastic. But anything by Compass Classroom is likely to be. Especially anything that features Dwane Thomas. This runs $15, which is $1.50 per lesson. Totally affordable. Each lesson covers a single English word -- like "write" in the second lesson. You learn the Latin root (scribo/scriptum) and the Greek root (grapho). For each root, you learn TEN English words (proscribe, cacography). So that is about a nickel per vocabulary word right now. Even when not on sale, we talking $15 for the whole thing. A bargain, I tell you. Each lesson includes a video that is around 15 minutes in length, and it features a few characters, all played by Dwane. 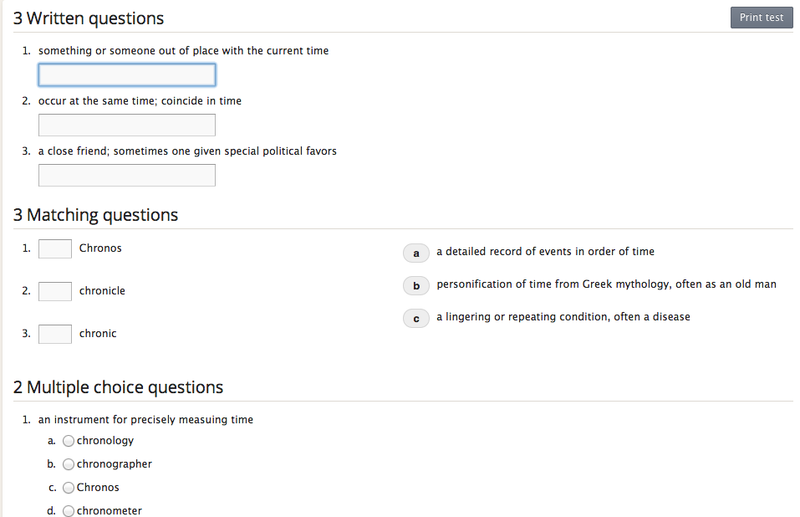 After the video, you also have access to Quizlet for more workbook-ish work with the ten words for the Latin root, and another Quizlet area for the ten words for the Greek root. The guy who introduces each word. In this case, he's introducing the word "time." This guy is definitely goofy. 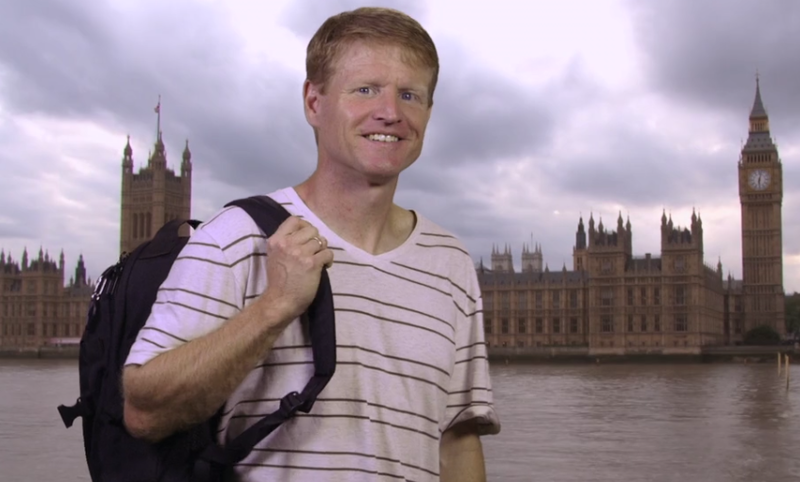 In this video, he's taking his kids (off-screen) to explore London. This segment is only around 45 seconds, before the opening credits. The announcer. 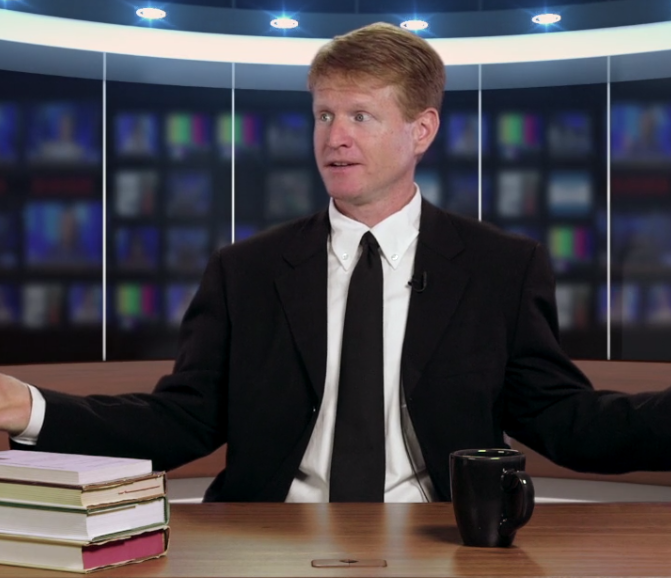 Suit and tie, in studio, he's the guy who transitions between the various segments and provides commentary on the strange antics of the first guy. We see him in between pretty much everything. In this particular video, he's complaining about how much we must be spending to send that first guy to London. He also wants to know why he doesn't have a clock anywhere in the studio. Then we get to the meat of the lesson. Here we have the Latin Expert. He gives us the Latin root, always in front of cool Roman backgrounds. He then goes through ten vocabulary words, with sometimes offbeat comments about the words, and always there is something in the background to help you to figure out the words too. Some of the words are fairly common, some are more obscure or specialized. Words for Tempus include temporary, contemporary, extemporaneous, temporal, atemporal, tempo, tense, temporize, contretemps, tempest. In this lesson, he talks about how a word like tense (present tense, past tense, future tense) did come from tempus through French, and that is why it doesn't LOOK like it comes from tempus. He tells a joke, and comments on how that joke works because tense has another meaning too (tension), and that tense also comes from Latin, but not through French this time. After a trip back to the announcer, who now has a pink clock, we head on. The final character is the Greek Expert. As you can see above, you get to see the Greek root in both Greek and English letters. That is something we really appreciate. Again, we get great Greek backgrounds for the first part of his segment. Again, the words range from fairly common (though not really common in this particular lesson) to more obscure. The words included in this lesson are Chronos, crony, chronic, chronicle, chronology, chronograph, chronometer, anachronism, synchronize, and diachronic. In talking about the various words, The Greek Expert covers all kinds of material, not just short little definitions. What shows up in the background varies a lot -- a statue of Father Time (Chronos), a photo of the White House (crony), an x-ray of a knee (chronic), a map of Narnia (chronicle), a gorgeous historical timeline (chronology), a timepiece (chronograph), another timepiece (chronometer), a Pilgrim with modern glasses and a camera (anachronism), video of swimmers and divers (synchronize), and various pages written in English from long ago (diachronic). For many of those, there were other images too. And The Greek Expert's explanations make the background pictures make sense. And the end of the episode, we go back to the Announcer, who can't get his pink alarm clock to stop. The videos are a little silly, but very memorable. Everyone here, from the 8-year-old to Mom and Dad, love them. Dumb jokes, fun little comments, interesting trivia related to the words, all combine to make the words stick. Of course, then you go to Quizlet to cement that knowledge. I do not have the 8- and 10-year-olds doing Quizlet independently. The teens all certainly can though. In Quizlet, you can look at a nice, dictionary-style list of the words. You can do flashcards. You can do various exercises that have you typing the word from the written definition, or from listening to it. There is a test, which I really love. You can choose what types of questions it will ask, so if I do have the younger two use this, I just make sure they don't have to do the "written questions" format, and instead they get multiple choice, matching, and/or true false. The student can do the work on the computer, or you can print the tests. I love that, except that then I have to grade it. There are also a couple of games, but we don't tend to use those. I LOVE THIS PRODUCT. Everyone needs this. Seriously. "Mom, promise you'll buy any more of these that come out." Need I say more? My kids have really learned the words in the lessons. The elementary kiddos don't necessarily "own" the obscure words, but they really know the more common ones, and most of the sort of obscure ones. The teens (who are actually more of the target audience) truly learned the words. This is available as a download -- which I love, as I can easily put the video onto the iPad or computer -- or as a DVD. Same $15 regular price, though you need to add shipping for a DVD.